Inspired by the great song from Blind Guardian. A clown with lute on his shoulder. He is going to sing the lyrics. i used the santa outfit for this and put a sinx scarf and a big flower on her head. Kobashi from Pitaten. Inspired by the Anime series. Create with nekomimi ears ,small twin ribbons and fermal gm sprite. Gildmate who ask me to make him an avatar. This Idea comes into my mind. Because he was really looking forward to High Wizzard. A sprite edit for a Signature Request. A very simple edit ,but i like it looks funny.a wizard who stole the big golden bell from Moonlight Flower. I animate the bell moving. Asmaria a guildmate ask me to make her a Sprite edit. She wants a male and fermale Highpriest who hugs each other. But it looks a bit strange to me , then a make i it he lay his arm around her.I think this light blue robe from fermale high priest suit there very well. maybe there could be something done with the kneeling male HP-sprite, or you just move the male one a lot more behind the female.
" Helm of Evil Wing" and " Violet Potion"
I was bored ,sort my collection and this Idea comes into my mind. I allready post it few days before here on Rocards. I admire Chinos Style to make such beautiful Bigsprites. Than try my best and make a sprite with this Style but i cant make it looks like her ^^. i cant see any pic T__T whats wrong? The Idea for this edit i have some days ago. When i heard the new song from Subway to sally- Eisblumen ( Iceflowers) first. But its hard to find a snowflake brush or usefull flower for a signature. I allready post it on rocards but i corect the outlines a bit ,there smaller now and it looks a bit better than before. A friend of me ask me make him a pink and cute-gaylike sig. i made a bigsprite from. Ist eine Art wasserzeichen ,um bilderdiebe schnell aufzuspüren dies bei sich verwenden. My priestes with a new version of Bunny Band an cute heart on her right soc. i'm not sure, but if that behind her bum is a bunny-tail, then it dosen't match the ears. i like it except i think the outlines of the ears shouldnt be black but gray or something. Our GuildBard, he would see his chara surfin on a wave. And he means this fits pefect to to him. It seems my guild members love my edits Stahlhand ask me to make him a Avatar too. Iam have such a great mooth at this days.. spring ,sun and high tempratures makes me smilie. he sure does look evil with his finger and his cute teddy sitting in the cart. hmm just wondering where the background is from..snes or rpgmaker? Ist eine recht spontane sache gewessen.Liebe allgemein die mythen und geheimnisse um den Mond und seine bedeutung für die menschen. Wow. 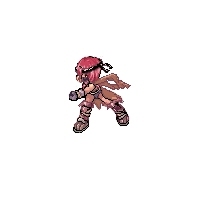 This is really a neat sprite! I can see this sprite being a monster or something and one of the bosses too. Erm... the goat.... is crying??!! wwwooooowwwwwwww i love it :D may i use it on my server? The woman really is very beautiful. my new work , its my new ava ...i use the turtle shell from medusa und the Halo from lude.And the animation from Cute Pet Sohee. O.O those wings are great. i use that idea of "good and bad" for a few of my characters too^^ but i chose green instead of blue. exprimental : dancer sprite mix with valkyrie wings and staff. I made a Sigature from it. Yeah, he had a genius Hairstyle but it looks good. Hmm ich kann halt kein englisch also Deutsch.